For our payload container build tomorrow, how’s 2PM? THAT IS AWESOME! Probably one of the coolest launches i have seen in some time! You didn’t have a cutter relay / FET / Darlington in there. Looks like there’s enough room anyway, just don’t forget we need it. I can do 2. See y’all in a little bit. Chesley, sounds good, I’ll see you up at the space. I have two 2ft X 2ft sheets of 1" thick foamular we can cut and use. The 1/2" thick is only available in 4x8 sheets, and I want to have to cut it down in the store to fit in my car. I had a lot of fun building, testing and flying today. SVG Lasercutter File - Full Spectrum laser cutter did not produce optimal results - difficulty to evenly cut through thick material without burning. Best results were at 1% power with 70% speed. Lasersaur was down, but we should test with it when available. The easiest way to recieve the APRS signal with our (now plenthora) of Baofeng radios, is to use APRSDroid as a software TNC. I’ll be making 4 cables to connect the radios to Android phones/tablets. 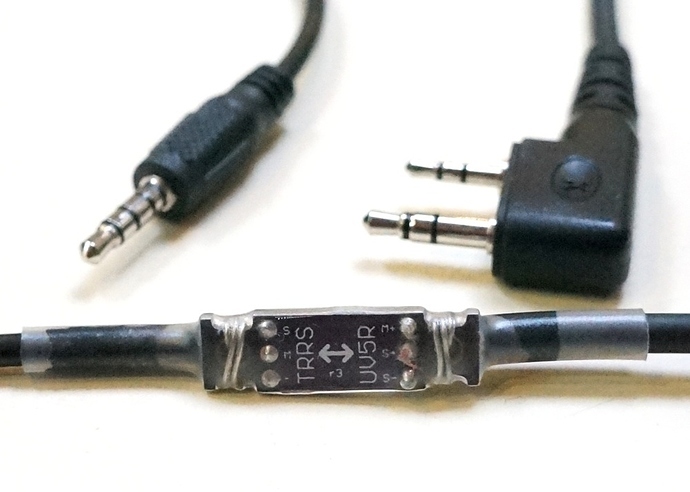 The cables will use a tiny PCB that will help the Android devices detect the microphone, and remove DC bias from the signal to allow for better processing. Hi again all, looks like you’re making some great progress with the project. I use APRSdroid the lazy way, just acoustically coupling it to my phone and it works great, even in rather noisy environments, though the adapter you built looks pretty snazzy. I would also suggest looking into a spot as a last ditch tracker to avoid losing the payload. Chesley, I have your radios and rebar you left in common area last Saturday night. It was there on Tuesday sitting where we had been working on Saturday. I will get it to you at the August 3 meeting unless you want to meet before then. Source: Docket No. 1457, 29 FR 47, Jan. 3, 1964, unless otherwise noted. This subpart applies to the operation of unmanned free balloons. However, a person operating an unmanned free balloon within a restricted area must comply only with §101.33 (d) and (e) and with any additional limitations that are imposed by the using or controlling agency, as appropriate. (e) In such a manner that impact of the balloon, or part thereof including its payload, with the surface creates a hazard to persons or property not associated with the operation. §101.35 Equipment and marking requirements. (3) The balloon envelope is equipped with a radar reflective device(s) or material that will present an echo to surface radar operating in the 200 MHz to 2700 MHz frequency range. The operator shall activate the appropriate devices required by paragraphs (a) (1) and (2) of this section when weather conditions are less than those prescribed for operation under this subpart, or if a malfunction or any other reason makes the further operation hazardous to other air traffic or to persons and property on the surface. (b) No person may operate an unmanned free balloon below 60,000 feet standard pressure altitude between sunset and sunrise (as corrected to the altitude of operation) unless the balloon and its attachments and payload, whether or not they become separated during the operation, are equipped with lights that are visible for at least 5 miles and have a flash frequency of at least 40, and not more than 100, cycles per minute. © No person may operate an unmanned free balloon that is equipped with a trailing antenna that requires an impact force of more than 50 pounds to break it at any point, unless the antenna has colored pennants or streamers that are attached at not more than 50 foot intervals and that are visible for at least one mile. (d) No person may operate between sunrise and sunset an unmanned free balloon that is equipped with a suspension device (other than a highly conspicuously colored open parachute) more than 50 feet along, unless the suspension device is colored in alternate bands of high conspicuity colors or has colored pennants or streamers attached which are visible for at least one mile. (2) The estimated date and time of launching, amended as necessary to remain within plus or minus 30 minutes. (3) The location of the launching site. (5) The forecast trajectory and estimated time to cruising altitude or 60,000 feet standard pressure altitude, whichever is lower. (6) The length and diameter of the balloon, length of the suspension device, weight of the payload, and length of the trailing antenna. (7) The duration of flight. (8) The forecast time and location of impact with the surface of the earth. (b) For solar or cosmic disturbance investigations involving a critical time element, the information in paragraph (a) of this section shall be given within 30 minutes to 24 hours before beginning the operation. © Cancellation notice: If the operation is canceled, the person who intended to conduct the operation shall immediately notify the nearest FAA ATC facility. (d) Launch notice: Each person operating an unmanned free balloon shall notify the nearest FAA or military ATC facility of the launch time immediately after the balloon is launched. (2) Forward any balloon position reports requested by ATC. (1) The current geographical position. (3) The forecast time of penetration of 60,000 feet standard pressure altitude (if applicable). (4) The forecast trajectory for the balance of the flight. (5) The forecast time and location of impact with the surface of the earth. © If a balloon position report is not recorded for any two-hour period of flight, the person operating an unmanned free balloon shall immediately notify the nearest FAA ATC facility. The notice shall include the last recorded position and any revision of the forecast trajectory. The nearest FAA ATC facility shall be notified immediately when tracking of the balloon is re-established. (d) Each person operating an unmanned free balloon shall notify the nearest FAA ATC facility when the operation is ended. Reminder: meeting is tomorrow (Tuesday, 8/4) at 7pm. I have the NiChrome wire, so I’ll probably work the cutter system. Bit of a 1 man show, although Jon got me my radios back (thanks!). I was able to work with the NFET cutter a bit. Too bad I forgot to put the resistor on the high side and put it on the low side instead; it took way too long to figure out why it wasn’t working right. ¯\_(ツ)_/¯ Oh well, it’s basically together, and next time I can bring my fishing line and paracord and work on best ways to tie the line. What concerns me is how the wire will run above the parachute. It’ll cut, then it will theoretically need to move to below the parachute without setting the chute on fire. Decent chance it cools before two seconds pass, but I’d like to make sure whatever we have works before launch. I have an idea for a platform thing we could attach to several marbles so there’s a structure to hold it away from the chute; I can pursue this if necessary. How about a simple experiment? Bring it up to temp, cut the power and see how fast the temp drops, use an IR Temp gauge and you’ll see the rate it cools. Do it say 10 times and you’ll have a reasonable approximation of the time/temp to expect. Nothing more elaborate than that. Density at altitude will be so much lower. Granted not all the cooling is convection (particularly since it gets incandescent), but I expect it to be an appreciable loss. Lower air density will also effect the efficiency of the heating element - less convection transfer. But as the balloon rises the bag expands making more cooling area (in colder air), of course the expansion itself will cause cooling. But good news is the surface area expands at a much lower rate than the volume so lift should increase faster than the cooling area, but then again it’s lower pressure so less buoyancy, but colder air means heavier air, again more buoyancy but faster cooling both because it’s denser air and colder air … my head hurts thinking about setting up the equation to calculate this. I would also assume the heating element wouldn’t kick on until the balloon reached: A) Predetermined altitude or B) the rate of ascent was below a certain rate so as to conserve power until really needed. This is a hot wire cutter, not a gas heater. It’s to cut the payload away once target altitude is reached, which sidesteps any problems we could run into from the balloon bursting, entangling the parachute, and causing the payload to plummet. It’s also more consistent and relatively light. My concern is that once the cutter cuts the line to the balloon, it could fall onto the parachute. If the cutter isn’t cool enough in such a scenario, this may lead to problems besides the risk of entangling the parachute. Cooling will occur through 3 mechanisms: conduction via the leads to the NiChrome, convection to the atmosphere, and radiation. Conduction and radiation will not be affected by altitude, but convection definitely will be. Whether this will mean the cutter stays hot enough to burn the parachute in a contact scenario is not known, since I’m not sure what percentage of cooling convection represents on the ground. I suspect it’s less than 30% (just a guess), but if that means the wire stays hot for one extra second at altitude, that could be enough to pose a problem. First step is to find out if we have a problem in the first place. If we put it all together and everything just works (consistently), then we don’t need to bother. I am just bringing up the concern as a possibility to be aware of. I misunderstood, I thought the goal was heat the bag. Will think about this some more. Initial thought is to just have an electro mechanical release at attachment point of cut-away object (harness has a ring that fits into slot with a pin in it that retracts releasing cord. Very short power pulse, low battery drain, could be done by power source on dropped object). Nothing to fall onto anything, no extra battery on over sized battery, just a very small solenoid. Solenoids are heavy compared to a hot wire setup, my experience (or rather the experience of the UTA rocket team members that came before me) is they’re ludicrously heavy. Best electromechanical solution I know of is a microservo that operates a latch of some kind, but I’m pretty sure that’s still heavier, esp. if you count the latch mechanism, and it requires PWM to operate (though that’s not really a problem since we’ve got a PixHawk). A different solution that’s preferred on rockets is explosive separation, but this presents its own set of issues (not least of which are legal issues), although we would likely be able to get something very light; it would still probably have a NiChrome hot wire type detonator, though. Hot wire cutter is super simple, pretty easy to think about, and we don’t even know if there is an insurmountable problem yet (it’s just we’re aware of potential sticking points), so in reality it’s a bit early to think about switching systems. The attachment point is currently above the chute so falling will always be a thing for any system we put up there. Hot wire should take 2-5A for maybe 2 seconds, equivalent of 5mAh at most, which is only significant if we’re using a crazy small LiPo; if we do LiPo it’s really only a matter of making sure the C is high enough. The power source is already on the dropped object. Although I hadn’t thought of making the cutter an independently powered system … hmm. It would save running 2 wires from the box to above the parachute, so like 10-12ft of wire saved. But then we got to keep the battery warm, and we still need a signal wire, so … meh, I’m going to stay with the current concept for now. Maybe I should draw out the current concept in as much detail as I can. I will be out of town on a business trip this coming Tuesday. Do y’all want to go ahead and work on it without me? I’ll be up there Tuesday, and will work on additional testing with our APRS transmitter, as well as receiving with the Baofengs/APRSDroid. If anyone else comes, we can discuss/work on other stuff as well! Next regular meeting is tomorrow at 7pm. I will be working on the helium connector if it gets to me in the mail by tomorrow, otherwise I will be working on the cutter and parachute attachment system; I have an idea of using a bunch of trucker’s hitches to get a sort of stacked pulley effect, but I’m not sure if the resulting friction will be too great for the weight of the box to overcome and actually fall off consistently.